Have you ever been in that little bodega around the corner from you? Do you even have one? What do you buy there? Do they sell food? Do you know the owner? In this interview, Ariel talks about the value of bodegas in a community and what her organization did to try to support them. You’ll learn about the challenges Food and Liquor Project faced and what small steps you can take in your own community to support small, local shops. What got you interested in bodegas? A lot of them have really crazy stuff, even if they don’t have produce. I live two blocks away from a Whole Foods and I shop there, too. But, I also live one block away from the bodega/corner store that started it all. 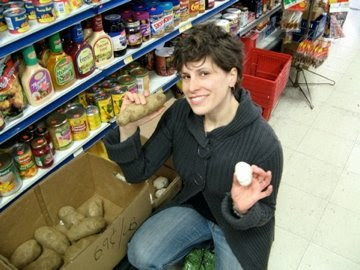 This is the store that made me realize that bodegas are awesome, and it’s called Alta Vista Foods. It’s the size of a very small storefront and it goes all the way back with two aisles with food stocked up to the ceiling, including produce and meat. I’m not going to buy the meat, no offense to them. But, they’ve got tons of produce and all these soups and spices and ice cream and TV dinners and an entire Mexican section and an entire cleaning products section. They have pet food, they have baking supplies, they have dry beans and canned beans, dried fruit, and it has pretty much everything that you need. If you really need saffron or something, they’re not going to have that, but if you need milk, this place is literally attached to the train station so you don’t have to go outside to go there. It’s at the Sheridan Red Line stop and it’s amazing. It’s so nice to have something like that that is on your way home and you don’t have to make a grocery store trip. There was an article in the Trib, maybe three weeks ago, about how the CTA and the city are trying to figure out how to develop more grocery stores in the train stations. I don’t think that had anything to do with us, but I think they realized that those things are great and we should have more of them. Do you do a large percentage of your shopping at bodegas? I do a fair amount, but my other issue that I deal with is sustainable food. I like organic, local, seasonal foods, and so I’m not going to lie: I shop at farmers’ markets and Whole Foods. I want the foods that I buy for myself to be organic and local (local probably above organic). Long story short, no, I don’t buy a ton of food at bodegas, but I do buy some. I go in that store frequently because I always need something. I don’t want to go the other direction, away from my house, to get a lemon. So, I’m going to go to Alta Vista Foods and I’m going to get this lemon. Or, I need some milk. I don’t do my main shopping there. That’s the idea of the corner store and what you should expect to do with a corner store. Yeah, there’s always going to be a need for big grocery stores, I think. But, these ones are the in-between shops, like, “Oh crap, I ran out of bread,” and you can get it there. So, I think if you think about it (I don’t have a car so this doesn’t even occur to me), from a global warming perspective, does that save you an extra trip to the grocery store if you usually drive? If a lot of people start doing that, it would be another positive thing that bodegas provide: transit-oriented, neighborhood-oriented grocery stores. What did you hope to achieve with the Food and Liquor project? The Food and Liquor Project started in June of last year and the activity wrapped up in May of this year. There were about nine of us working on the project. It started when my friend Arline Welty and I realized that some of our bodegas were just treasure troves of awesome food. Then, there were other ones that had absolutely nothing. - only Gatorade and Cheetos and cigarettes. We were interested in what the difference was between those two, and also how the ones that had all this awesome produce and awesome food got that way, and how to make that happen with more stores. With support from Neighbors Project, we started doing walkabouts. (I lived in Australia for a year, so that’s where that came from.) We would just walk around our neighborhood on the main strips, because they had the most bodegas on them, and just go into stores and say, “Hello. It’s awesome that you have food.” We just started to develop a relationship with them, figure out what they were doing, and see if they were open to getting more produce in their stores. If they weren’t, we wanted to know if they had tried it before and what the reasons were for why they didn’t want to, or why they stopped before. How did the store owners respond when you asked them about having more produce in their stores? What stopped them from bringing in more produce? The reason that was most common was that produce is perishable, so if they buy a case of bananas and they only sell half of it before it goes bad, then they have to throw out the other half. Then, they probably lose money on that purchase. Along with perishability is low turnover: people don’t think about shopping at a place that usually just sells Gatorade as a place to buy produce. You also have a low profit margin. With some things, I bet if you only sold half, you’d probably be fine; with produce, you’re probably only making a couple cents off of each sale, and if you lose even some of it to spoilage then you lose money on it. Also, they’re not really marketing that they have produce, so people don’t recognize it. People don’t think of it as a place to go to buy produce. What did you do to try to get the consumers more interested in bodegas? In January, we decided to switch our focus a little bit to the consumer end, trying to send the message that your corner store is a great place to shop. It’s not just a place to buy cigarettes and you should be able to buy food here. You can support these local businesses and keep these businesses that were here before the gentrification started in this community. 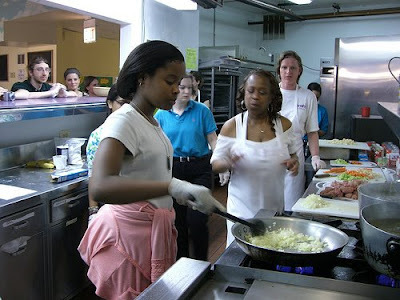 We decided to hold a cooking class at a social service agency called Inspiration Café and invite all the residents of Uptown to it. All the food we cooked there was bought from corner stores. So, it was all very simple, adaptable dishes where you could buy the ingredients at most bodegas - pasta and sauce where you could buy the pasta, you could buy tomatoes, and put some mushrooms and sausage. Did the cooking class have an impact on the community? We got a lot of really good press for it. I feel like it really connected us even more with these store owners, because they knew that we were buying stuff from them and we were encouraging people to shop at those stores. We had a fairly low turnout for the event, which was a disappointment, but the good press we got counteracted that. The best thing, to me, that came out of it was that we were covered in multiple media outlets, including one in Spanish, La Raza, the biggest Spanish language newspaper - we had a full page spread. They just talked about what is at your corner store and why it’s a great place to shop. It had a little sidebar about seasonal food, because we also had a nutritionist at the event who talked about healthy eating and eating well on a budget and things like that. If you buy food that is in season, it’s cheaper because it’s abundant, like apples in the fall, berries in the summer, stuff like that. If you want to buy berries in the winter, you’re not going to have much luck. So, that was really exciting and I feel like that reached a lot of people and a crowd that would be very difficult for us to reach. Though, if we were to do it again, there would definitely be some things that we would improve on in terms of outreach and partnering with organizations to improve attendance. Were any of the owners interested in bringing in produce? A lot of them also were like, “Yeah it would be great, but we can’t afford to buy a cooler. I would love to do that, but you tell me where the money is going to come from to buy a cooler.” So, that would be yet another problem. The ones that we worked with were really pumped about it. They were like, “I would love to have green peppers and cilantro!” They would get really animated about it and they wanted to do it, but there were these obstacles in the way. That is what makes you think that there is hope that it could happen. It was just that we didn’t have the resources at our fingertips to really help them with that. We put them in touch with the aldermen because the aldermen had some small business grants that they could have been eligible for. But some of them don’t have good relationships with the aldermen for whatever reason, so that kind of fell through. If you were to do this again, what would you do differently to make the project more effective? The other thing would be to partner with a church or a community organization that had constituents and they would help put on the cooking class. I think the cooking class would be very successful. It was really, really fun. Everyone had an awesome time. We did it with Share our Strength. One of their subgroups is called Operation Frontline, they put on these cooking classes that are either free or cheap for low income families to talk about nutrition and also teach people how to cook well on a budget. The issue was that we didn’t have enough people at the event. I think that if we had worked with Uptown United Church, or another community group, and they knew what kind of food that their congregants would want at this event, and they talked about it all the time at services, and were helping us put it on, we would have had an established base of people who were going to attend. Also, it would root us more strongly in that community. That is number one on our list of things that we would do over, that we would be involved with, with those kinds of community groups from the beginning, not just when we were already planning the cooking class. Is the hope that this will take off in other cities? If I wanted to start something like this in St. Louis, what advice would you have for me? My advice would be to just start walking around and talking to people. See what your community has and what your neighborhood has. Figure out what you would like to see and if the store owners would also want those things, or if other consumers you know would want those things. In addition, before you launch in fully to the project, do an environmental scan of the other efforts in your neighborhood - the other community organizations. Connect with them and find out what’s going on - is there an existing effort that you can help out with that is already working on this? If there is not, then start figuring out what it would take to make your corner stores be a little healthier and a little more worth shopping at. I think the really big thing is that you know it is going to take a fair amount of time, and I would encourage either partnering with another organization or at least some other person. I don’t think its something that a single person could do by themselves. But, if it was just you by yourself, an individual can make an impact by shopping at those stores and then talking to the guy at the counter and be like, “I would really like to be able to buy apples here. Can you do that?” That’s not even a project, you just have to say it and it would take 30 seconds. But, they respond to that, they are small and they can add things that you want quickly. What are you working on now that Food and Liquor is done? The next step for Neighbors Project is the Bodega Party in a Box. It’s kind of taking our cooking class, our cooking parties if you will, and making it so that lots of people can do this. The Bodega Party in a Box is a box with a cookbook that we developed with lots of food writers all over the country with recipes that have ingredients that you could buy from your corner store. 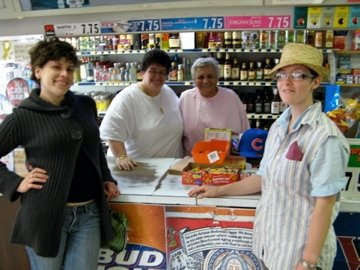 It talks a lot about bodegas and what to expect there and how to interact with the owner. Then, it has invitations and little flags to decorate so that you can have these parties where everybody makes a dish with food from their bodega. So, it’s a really cool idea and it’s really well done. It’s encouraging to people who just might go to Whole Foods or go to Jewel to check bodegas out, because they can look really intimidating or, “I wouldn’t want to shop there because it looks dirty,” or something like that. But, they are great! They’re awesome! How can someone get the Bodega in a Box kit? At the moment, you buy it online, but you can always use it for an idea and you can have a party without the Bodega Party in a Box. (Shh!) You can have your own invitations. That is at the Neighbors Project website, neighborsproject.org, and also at bodegapartyinabox.org. We’ve been getting really good responses on it so far, and a fair amount of coverage on it. People are interested. Does your day job have to do with food? When I started it, it did, kind of. I was the business manager of a non-profit called The Land Connection, a non-profit that works on sustainable agriculture issues. We were training new organic farmers and generally doing outreach mostly in central Illinois, but I was based in Evanston. Since then, I have switched jobs and careers and I am now a chef. So, I’m still working on food, but I don’t buy food for the restaurant from the corner stores. I actually just got a new job at one of the best sustainably-minded restaurants in the city, Uncommon Ground. It’s fantastic. It’s delicious. They have local, seasonal specials that change weekly based on what’s in season, and they have a roof garden that grows vegetables. I feel really lucky because I just started working as a chef in March and I’m at a place that I really support this early. I’m working on food, but I’m not necessarily working on food access issues at the moment. I have all these names running through my head. I love Anthony Bourdain. So, I would interview Anthony Bourdain. Though, that would not be very political. If I wanted to talk about food issues and things we talked about today, this is probably cliché, but I would interview Alice Waters. She was doing this before anyone was thinking about it. I don’t know how she had that foresight before anyone was really on this stuff. If I could interview a person who was dead, I would interview J. I. Rodale, who is the guy who started that whole organic gardening and farming empire. His company still publishes the best books about organic agriculture and they have a fantastic center, newfarm.org, in Pennsylvania. He was doing it way before Alice Waters. But again, that’s all sustainable food stuff, so that’s the other side of my passion. Another good interview. It'd be fun to eat at Uncommon Ground next time I'm in Chicago. Another great way to act local and get the most of the neighborhood. When neighbors support neighbors we all benefit.